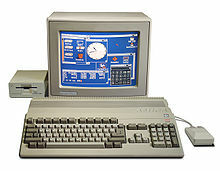 The Amiga was a line of personal computers that Commodore International produced during the 1980s and early 1990s. The first Amiga computer, the Amiga 1000, possessed a HAM mode enabled the machine to display 4096 colors, a chip that enabled it to play back four channels of sound at once, an operating system with multitasking, and a graphical user interface at a time that these features were uncommon or not as developed as Amiga's. The Amiga is often said to have been ahead of its time. Although the Amiga did not sell well and Commodore went bankrupt, the Amiga developed a fandom and niche amongst video and graphics enthusiasts and gamers. The Amiga was initially created by computer chip designer Jay Miner and Hi-Toro (later Amiga Corporation). In 1984, Commodore purchased Amiga Corporation. The first Amiga, the Amiga 1000, was released in 1985 after delays and marketing blunders. In 1994, Commodore declared bankruptcy. ↑ Reimer, Jeremy (2007-08-13). "A history of the Amiga, part 2: The birth of Amiga". Ars Technica. p. 2. Retrieved 2013-01-23. ↑ Reimer, Jeremy (2007-08-22). "A history of the Amiga, part 3: The first prototype". Ars Technica. p. 2. Retrieved 2013-01-25. ↑ Kahney, Leander (2000-03-20). "Amiga Back From the Dead Again". Wired. Retrieved 2013-01-25. ↑ Davis, Jim (1999-07-09). "Gateway's Amiga prepares for return". CNET News. Retrieved 2013-01-25. ↑ Jeremy Reimer (2005-01-17). "The Micro-AmigaOne and Amiga OS4 Developer Prerelease (Update 1)". Ars Technica. p. 1. Retrieved 23 January 2013. ↑ Shah, Agam (2012-03-22). "Amiga Computer Awakened From Sleep With Makeover". PCWorld. Retrieved 23 January 2013. ↑ Reimer, Jeremy (2007-08-13). "A history of the Amiga, part 2: The birth of Amiga". Ars Technica. p. 1. Retrieved 2013-01-23. ↑ Reimer, Jeremy (2007-08-22). "A history of the Amiga, part 3: The first prototype". Ars Technica. p. 3. Retrieved 2013-01-25. ↑ Reimer, Jeremy (2007-10-22). "A history of the Amiga, part 4: Enter Commodore". Ars Technica. p. 1. Retrieved 2013-01-25. ↑ Reimer, Jeremy (2007-12-10). "A history of the Amiga, part 5: postlaunch blues". Ars Technica. p. 1. Retrieved 2013-01-25. ↑ Reimer, Jeremy (2007-12-10). "A history of the Amiga, part 5: postlaunch blues". Ars Technica. p. 2. Retrieved 2013-01-25. ↑ Ashen, Stuart (2015). Terrible Old Games You've Probably Never Heard Of. Random House. ISBN 9781783522576.